Seniors get hurt at home more than any other location. 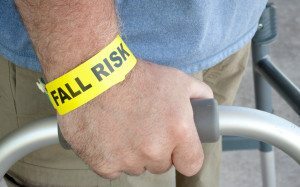 One study showed that of the seniors who fall 40% of them experience fractures in their hip and 20% of them die as die as a result of injuries sustained during a fall. For those receiving senior care at home, it is vitally important to make sure their homes are as fall-proof as possible. The first way to help seniors keep from falling in their home is to make sure anything that can cause them to trip or stumble be removed or replaced. Rugs, for instance, can easily slide out from under the feet. When a rug isn’t lying flat on the floor, it creates little gaps or holes that might cause someone to trip. One way to prevent slipping on a rug is to not have them in the house at all. For those who still want rugs, there are products on the market designed specifically to keep the corners of the rugs from curling. Buying rugs with skid-proof backing helps keep them in place. Other ways to prevent falling in the home include making sure clutter is picked up off the floor at all times and keep walking paths clear throughout the home. One study shows that the bathroom is the most common place in the home where injuries are sustained due to a fall. This finding included seniors who hurry too quickly into the bathroom and fall or trip on their way there. In the bathroom, the slippery surface of the bathtub makes it easy for seniors who are getting in or out to fall. Make sure the tub has a rubber mat and also grab bars nearby. There should also be grab bars by the toilet to help seniors sit and stand. It’s important to make sure these grab bars are attached securely to the wall. Even for those seniors who are receiving in-home care, they should make it a point to have contact with someone outside of their home at least once a day. They might also want to consider getting a medical alert system set up in the home that can respond to calls 24 hours a day. If you or an aging loved one are in need of senior care services in Great Neck, NY or the surrounding areas, contact the caring professionals at Star Multi Care Services today at (631)956-8835. We are the Right Choice for Home Health Care Services!